Is there anything more delicious than freshly made pasta? We think not. 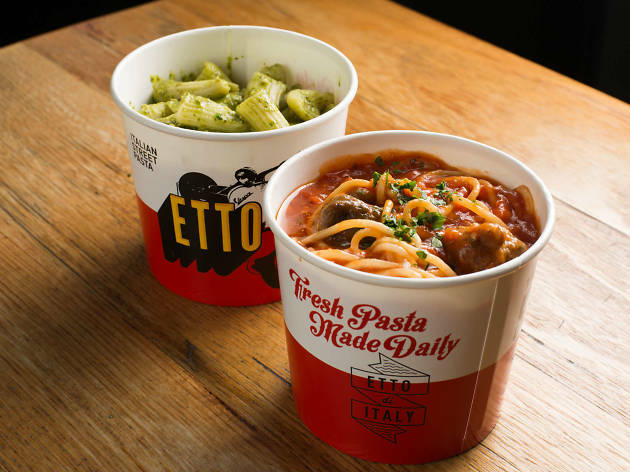 Etto pays homage to the casual and quick cuisine happening on the streets of Italy, with a special focus on fresh pasta made daily. There’s a DIY attitude to the menu. Pick your sauce first: the bolognese della Nonna and the amatriciana stand out on the red sauce front, but don’t forget the basil pesto di Genovese or the black truffle and salami if you like strong flavours. Then you select your pasta: there’s plenty of choice, from pappardelle to roasted pumpkin, goats cheese and sage ravioli, but ask the experts if you’re stuck for a good match. You can pimp your dish with add-ons if you desire, but sometimes it’s best to let the sauce speak for itself. 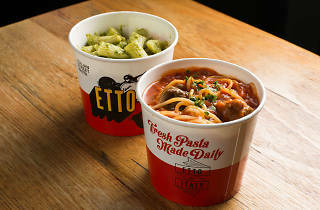 Signs that Etto is the real deal include the cabinets of fresh, flour-dusted pasta that take up most of the space inside their tiny South Melbourne digs. If you can’t find a spot to dine inside or out on their Clarendon Street-side tables, we suggest getting some pastas takeaway.